Has attained a Martindale-Hubbell rating of “AV-Preeminent”, the highest recognition possible in the legal profession, which is based on the confidential opinions of members of the bar and the judiciary and signifies very high ethical standards and very high to preeminent legal ability. Selected as a Missouri and Kansas Super Lawyer, initially in 2006, thereby being designated among the top 5% of Missouri and Kansas practicing attorneys, based on an extensive peer review and evaluation process conducted by Law and Politics. Contact by telephone at 314-862-3333 ext 17 or online at [email protected] to schedule an appointment. Serving clients throughout the St. Louis Metropolitan area. 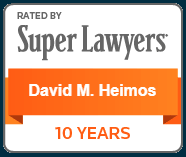 David M. Heimos is located in St. Louis, MO and serves clients in and around Florissant, Saint Ann, Saint Louis, Maryland Heights, Bridgeton, Saint Louis County and Saint Louis City County.